Security tokens might become the first type of crypto-asset to bridge the gap between established institutional investors and the crypto world. Part of the magic of security tokens is that, at least conceptually, they can be seen programmable, globally tradeable representations of existing financial products. As the security token space evolves, we are likely to see more crypto-securities that are modeled after established financial vehicles such as bonds, derivatives or stocks. However, for that to happen, the existing generation of security token protocols needs to incorporate some of the underlying mechanics of the basic financial assets. Not all security tokens are created equal. A token that represents a pool of real estate mortgages/leases is architecturally different than a token representing a fractional percentage of a Rembrandt and both are different from a token that represents the future value of shares in a private company. That level of differentiation is not yet present in the current generation of security token platforms but it should be one of the foundational building blocks of the next wave of platforms in the space(see my Security Token 2.0 thesis). In my opinion, the emergence of different classes of security tokens will be a key sign of the maturity of the space. This step was never important in utility tokens as their behavior is not dictated by financial assets. Security tokens on the other hand, are programmable representations of financial instruments and, consequently, they should imitate the economic behavior of the underlying asset. Debt Tokens: Tokens that represent a debt or cash generating vehicle. Equity Tokens: Tokens that represent an equity position in an underlying asset. Hybrid/Convertible Tokens: Tokens that convert between debt and equity based on their behavior. Derivative Tokens: Tokens that derive its value from underlying tokens. While models such as Securitize’s DS Protocols or Harbor’s R-Token represent the compliance layer of security tokens, these new types of security tokens will dictate their financial foundation. In the next few sections of this essay, I would like to deep dive into the protocols that can enable the different types of security tokens. Today, I would like to focus on debt instruments. Dividend: Debt security tokens are typically structured to produce a regular dividend based on the payments of the underlying debt instrument. Risk: Debt security tokens are subject to risks of default of the debtors or drastic changes in the valuation of the debt. The reason risk and dividends are so important is because they dictate the pricing of a security token. A real estate mortgage with a medium risk of default can’t be priced the same way as a bond of a pre-IPO company. Risk and dividend are key factors that should be modeled in the pricing of a security token. In blockchain terms, the smart contract representing a debt security token should include operations such as repayment terms that dictate the dividend model but also incorporate the different risk factors of the underlying debt. If risk is such an important factor in debt security tokens then we should consider how to mitigate it or hedge against it. Collateralized Debt Obligations(CDOs) were one of the poster child of the 2008 financial crisis but its an interesting model to apply to security tokens. Conceptually, a CDO pools together cash flow-generating assets such as mortgage loans or bonds and repackages this asset pool into discrete tranches that can be sold to investors. Each tranche in a CDO has a different risk profile with the senior tranches being generally safer and getting the first priority of liquidity. The concept of the CDO is that higher risk debts can be hedged by being packaged together with safer debts. Applying the concept of CDOs to debt security tokens, we can envision a token that is an aggregation of security tokens with different risk profiles. These tokenized securities can combined the high-dividend/high-risk model of riskier debt tokens with the medium-dividend/low-risk model of safer debt instruments. Debtor: A party in a debt transaction who is borrowing an asset and owes a creditor some agreed upon value. Creditor: A party in a debt transaction who is lending an asset is owed some agreed upon value by a debtor. Relayers: Entities that aggregate signed debt order messages and host the messages in a centralized order book and provide retail investors with the ability to invest in the requested debt orders by filling the signed debt orders. Debt agreement in Dharma are represented by Term Contracts which include elements such as repayment terms or risk models. Technically, terms contracts expose a standard interface of methods for both registering debtor repayments, and programmatically querying the repayment status of the debt asset during and after the loan’s term. 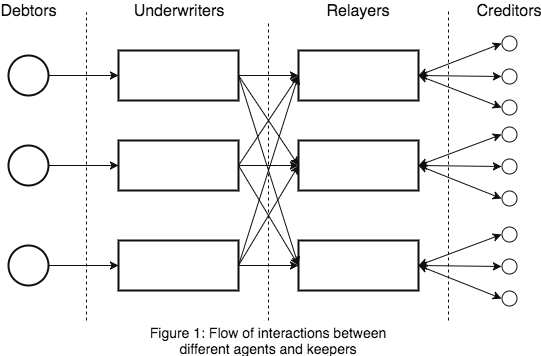 At the most basic level, a security token platform adopting Dharma would play to the role of a Relayer and integrate with a network of Underwriter nodes. The debt security tokens would be modeled as Term Contracts. Many of the dynamics of the Dharma protocol in terms of repayments, collection or default conditions can be adapted to the security token model. Given its cash producing nature, debt security tokens are likely to become one of the most popular types of tokenized securities in the near future. Obviously, new protocols would have to be created to support this endeavor but technologies like Dharma certainly provide a great starting point.